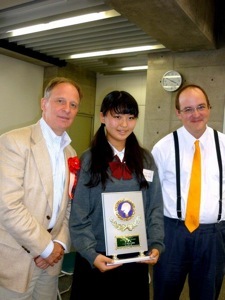 Last Saturday, I took our debate team to the First Okayama Debate Tournament. 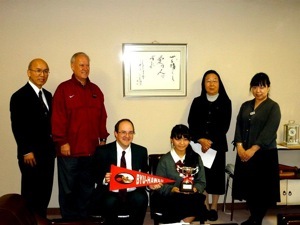 The tournament was held at Asahi High School in Okayama. Our students lost one round and they won one round. I am REALLY proud of them. All of the teams were great and everybody was really positive. I was very happy to meet a couple of former students who have gone on to other schools. I'm glad to see that they're continuing to build their debate skills. I was a judge for two rounds. I am especially grateful to Seishin teacher Matthew Davis. He was the real leader of our debate team, and I have really learned a lot from him about debate. Last week, our school was visited by representatives of Brigham Young University in Hawaii and representatives of their speech contest. They visited because our student won the preliminary contest and will go to the finals next month. I thought it was a REALLY nice thing for them to come and meet us. I enjoyed meeting them and learning about Brigham Young University Hawaii. These photos were taken by my student's mother and by a friend of the family. My student's mother kindly let me use her photos here. In this last picture, they came to visit the debate team! 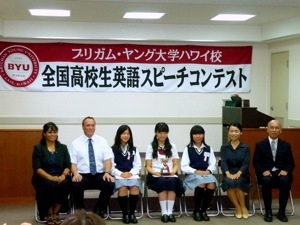 First, on September 29th, one of my high school students went to the Brigham Young University Speech Contest Preliminary held in Hiroshima. 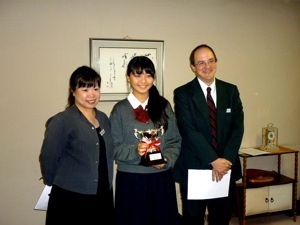 There, she won first prize! I unfortunately could not go, but her mother allowed me to post the photos she took! 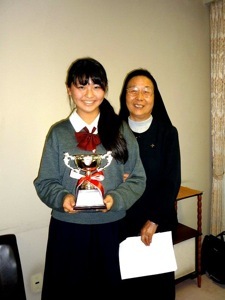 Next, my student went on to the Notre Dame Seishin University Speech contest with a completely DIFFERENT speech (on a whole other topic!) and she again won first prize! 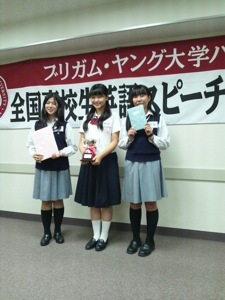 Next, on October 14, one of my high school second grade students went to the finals for the Seiran Trophy at Kitakyushu University. There, she won second prize in a VERY tough contest. 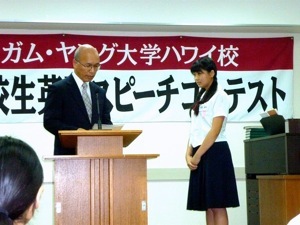 Finally, one of my junior high school third graders went to the Kurashiki Mayor's Cup English Speech Contest. Again, it was a very high-level contest with a lot of really, really great speeches. It was really sad that there were some students who really did a fantastic job, but there just weren't enough trophies for all the good speeches. That's not Kurashiki's fault though. They had a good number of prizes, but there were just more good speeches than prizes this year. My student got third prize, and we felt pretty good about that. 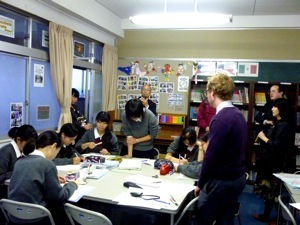 Here is a very rare picture of the English Club! On Wednesdays, we do NHK Radio Eikaiwa together. It's a great 15 minute radio program. It's really good for a range of levels! It's not too hard, but not too easy either.